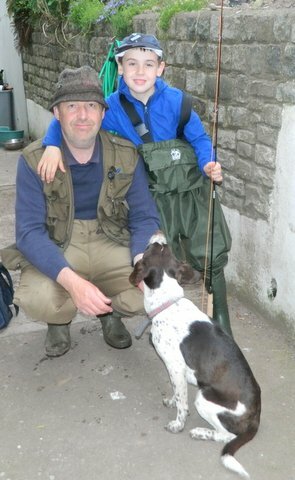 The latest news from Ireland is that my nephew John Hogan has caught his first brown trout on a fly. His Dad sent me the news and his Mum sent me a photograph featuring John, his Dad Sean, and Meg the dog. This is a fine accomplishment for such a young angler. Well done, John! Here is the angling party on the big day. If he keeps at it maybe one day John will become as good a fisherman as his old man. Hi Katie, I´m afraid there is no hope for him now!